I may have solved a design issue with the combustion of the wood gas in a TLUD. I call it the "Toucan Flair", which is a play on words (flair > flare) because the distinguishing feature is an axial tube providing "axial air" to the secondary combustion zone. This axial air source is coupled to the primary air source, which is controlled by a small fan pressurizing a plenum to support the two burners provided for the entire stove. Additional "scroll air" enters in the riser above the ignition level for the wood gas, providing a concentrated region of combustion. 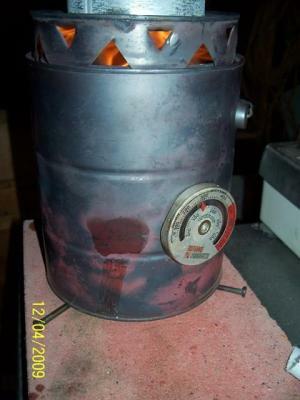 Depending on how much wood gas is generated, as controlled by the degree of fan assist, the flames can be driven to the bottom of the pot, but the unit can also simmer as required (see photos). This geometry basically turns the concentrator disk inside out - and make for a preheated expanding jet of wood gas, that is consumed by the excess scroll air. Axial and scroll are burner terms for air injected inside the fuel and provided on the perimeter of the fuel. The terms may well be engineering slang. However, the effect is significant, based on my comparison of the side by side configurations (Toucan Flair versus traditional concentrator disk TLUD). A Power Point Presentation presented at the 2010 ETHOS Conference. It is a bit "tongue in cheek." Biomass Energy Consultant with BEF, & Partner in Chip Energy.